Summary: Captain Samantha Carter is torn between two lives as she continues the millennia-long mission of her symbiote. Summary: A rift has developed between Sam and Jack. Summary: The lives of Sam and Jack have been changed drastically...will they make the right decisions? Summary: Sam disappears and Jack is the only one who can save her. Summary: Jack and Daniel are enslaved by a matriarchal society. Summary: Pete gets violent, Sam get stubborn and Jack gets mad. Summary: Jack and Sam have finally decided to move on in their life together, but now Jack’s left holding their baby and trying to find out exactly where in the universe Sam has been taken. If she’s ever found, will they be able to live happily ever after? Summary: After a year of living together, raising their daughter, Sam and Jack have come too close to the imaginary line placed between them and Sam has forced them to back down from it. A lot of others have their own thoughts on the subject matter though. Have they become too distracted and does someone else have plans for them? Summary: "Heaven has no rage, like love to hatred turned; Nor hell a fury, like a woman scorned." (William Congreve, The Mourning Bride, 1697). Summary: Jack and Daniel individually ponder on what sacrifices their ongoing	mission demands of SG-1’s personal lives. Triggered by current events, painful memories from Jack's first black op mission resurface. He must find a way to protect the one he loves and deal with his anguish and pain. Summary: After being separated from his team, Jack has to survive in a world of torture and pain with only one memory; a blond angel. Summary: The fury of mythical beings strikes SGC involving the Team and everyone on Earth in a war of evil against good. With Thanks ... for Mary D! Disclaimer: All publicly recognizable characters and settings are the property of their respective owners. The original characters and plot are the property of the author. No money is being made from this work. No copyright infringement is intended. Summary: This is part one of a three-part, alternate storyline to the episodes in Season 8. It is also a sequel to “A Matter of Survival”. This was my very first attempt at fanfiction, but I have revised the writing a little although the story remained the same. Find out what happens next in Part Two: Decisions. Summary: Since when has the story of SG-1 been a novel? 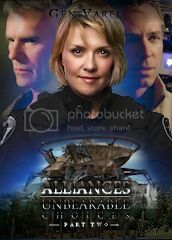 Summary: Captain Samantha Carter embarks on a new and exciting stage of her career encumbered by a grave personal mistake, while Colonel O’Neill gets a new lease on life unsuspecting that it comes with a very personal challenge. Summary: They're prisoners. But will they be rescued before it's too late? Captain Samantha Carter deals with divided loyalties in her mission against the Goa’uld. Summary: Another hot, sandy planet.